This may be quite shocking at first. 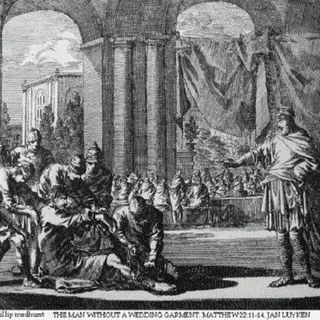 In this parable the king invited many to the wedding feast of his son. Many rejected the invitation. He then sent his servants out to gather anyone who would come and the hall was filled. But when the king came in, there was one not dressed in a wedding garment and we can see what happens to him in the passage above. Again, at first read this may be a bit shocking. Did this man really deserve to be bound hand and foot and thrown outside into the darkness where there is wailing and grinding of teeth, just because he didn’t have the right clothing on? Certainly not. Understanding this parable requires we understand the symbolism of the wedding garment. This garment is a symbol of one who is clothed in Christ and, specifically, one who is therefore filled with charity. There is a very interesting lesson to learn from this passage. First, the fact that this man was at the wedding feast means he responded to the invitation. This is an indication of faith. Therefore, this man does symbolize one who has faith. Second, the lack of a wedding garment means that he is one who has faith and believes all that God says, but has not allowed that faith to permeate his heart and soul to the point of producing true conversion and, therefore, true charity. It is the lacking of charity in the young man that condemns him. The interesting point is that it is possible for us to have faith, but to lack charity. Faith is believing what God reveals to us. But even the demons believe! Charity requires we embrace that will interiorly and let it transform our lives. This is an important point to understand because sometimes we can struggle with this same situation. At times we can find we believe on the level of faith, but are not living it. Both are required for a life of authentic holiness. Reflect, today, upon both your faith in all that God has spoken, and the charity that this hopefully produces in your life. Being a Christian means you let your faith sink from your head down to your heart and will. Lord, may I have deep faith in You and in all that You have spoken. May that faith sink into my heart producing love of You and others. Jesus, I trust in You.